Some of the most unusual college degrees can be entertaining to learn more about, but they also may provide unique career ideas. You don't have to believe in UFOs to search for life in space. Astrobiology students are involved in the complex study of life in the Universe. It is still considered an emerging field, so there is room for students to be involved in exciting new discoveries. Students at the Rensselaer Polytechnic Institute can take advantage of the New York Center for Astrobiology. The University of Washington is another school offering an astrobiology department. Harrisburg Area Community College in Pennsylvania offers a degree program in auctioneering. Graduates prepare to take the state licensing examination while learning about all aspects of being self-employed as an auctioneer. Carnegie Mellon is home to the only bagpipe major in the U.S. The program is part of the School of Music, one of many specific instruments on which students can choose to focus their musical studies. 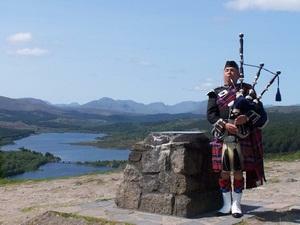 A 2009 graduate made the news as "the nation's only graduating bagpipe major." Vincennes University offers a degree in Bowling Industry Management. Students in the program learn the practical matters of running a bowling center, everything from lane care and pinsetter mechanics to human resources and customer service. This high-tech degree teaches students how to find digital evidence to be used in legal matters. Dissecting images and reconstructing hard drives may not be as thrilling as shows like CSI try to make forensics look on television, but for those who love digital technology, it may be the perfect career choice. Courses in computer forensics are most likely to be included as an area of concentration in a computer science degree or as part of a certificate program. For example, American InterContinental University Online offers a Bachelor of Information Technology with a concentration in computer forensics. The study of Egyptology may bring to mind movies about mummies and adventures in the pyramids. However, it is actually a highly specialized branch of archaeology. Due to its focus, a major in Egyptology is typically only available at the graduate level. Brown College features a Department of Egyptology and Ancient Western Asian Studies. Blacksmithing isn't just a trade of the past. At Southern Illinois University-Carbondale, students can earn an art degree with a focus on metalsmithing. Students work in the L. Brent Kington Blacksmith Shop, named after the professor who pioneered this art form at the college. Many people don't like to think about death, but for mortuary science majors, it's their business. Although the specific curriculum varies depending on the school and your future career goals, students can learn about the science of taking care of dead bodies, gain an understanding of the grieving process, and take courses to help them run a business as a funeral director. Mortuary science majors often supplement their studies with embalming. Students can earn a mortuary science degree at colleges and universities like the University of Minnesota and at specialized mortuary science schools like the Cincinnati College of Mortuary Science. Getting a degree in packaging almost sounds like material for a joke. Do you sit around and assemble cardboard boxes all day? However, packaging is a very real discipline involving science, math, business and psychology. Students who major in the field create and evaluate packaging materials, design systems for packaging products, perform quality control and many other tasks related to ensuring that products, from food to computers, arrive at their final destination in the desired condition. Michigan State University, the University of Wisconsin-Stout, and Clemson University are three schools that offer degrees in packaging. Kyung Hee University in Korea is home to the unusual Graduate Institute of Peace Studies. As of 2008, the program had graduated 327 students who explored topics like Civil Society and New Politics and Human Rights: Theory and Praxis. If reading about the most unusual college degrees has piqued your interest in exploring a new field of study, read more about the college major search and peruse a list of college majors.